Did you know that there’s a thing called Big Stick Ideology? It refers to U.S. President Theodore Roosevelt’s famous statement on foreign policy: “I have always been fond of the West African proverb: "Speak softly and carry a big stick; you will go far.” Roosevelt described this style as “the exercise of intelligent forethought and of decisive action sufficiently far in advance of any likely crisis.” The idea of negotiating peacefully but simultaneously threatening with the "big stick", or the military, has been one that the majority of US presidents have stuck closely to since Roosevelt was in office. Anyway, what we’re trying to say is: When you know you’ve got all the power, it’s easy to come correct at conflict! 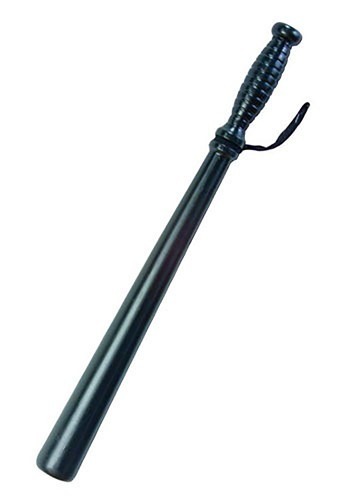 That’s why this deluxe Nightstick is so great - it adds a touch of authenticity to your officer costume, but it lets people know all on its own that you are not to be messed with. So you can chill out, relax, and enjoy all the benefits that come from being the Good Cop with a big (night)stick!